50/50: Secrets I learned running 50 marathons in 50 days…. 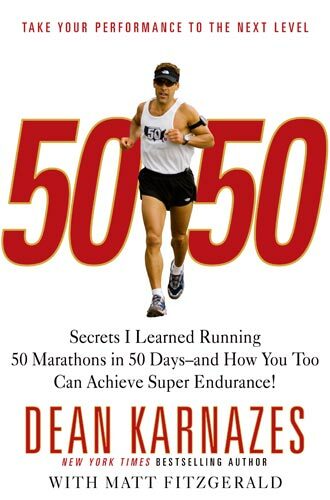 Dean Karnazes. After reading Ultramarathon Man, I thought I would read Dean’s second book, which details his journey of running 50 marathons in 50 days in 50 states. I have to admit, this one did not grab my attention like the other. I think it is due to the nature of most of the marathon’s — road runs which just don’t excite me. And the few trail marathons that were thrown in were not of the same level of adventure as the runs in his other book which are more like the long adventure races I prefer. Still, there were good moments and lots of good quotes, of which I’ll of course include a few. 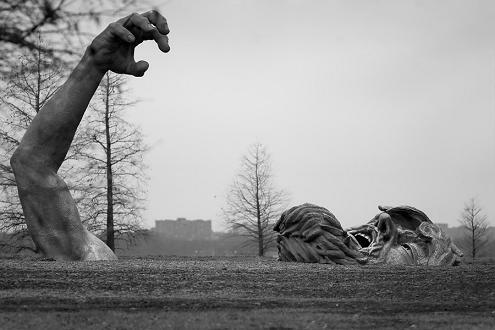 On “The Awakening” statue: Most statues, you look at. The Awakening forces you to look in. Treat yourself as an experiment of one. Don’t blindly copy the way others train. Try new workouts and methods often; keep those that work for you and discard the rest. Every runner is familiar with the sin of knowing better—of stubbornly pushing ahead despite warnings from the more sensible parts of our minds. The desire to keep running until the task is completed or the goal achieved is so great that it overrides our better knowledge and our self-protective faculties. … I found myself wondering why so many people like Kris are drawn to marathons and other such challenges these days. I can’t help thinking that the phenomenon is in part a largely unconscious backlash against comfort culture and the easy life. Heated seats and online shopping and robot vacuum cleaners have created a void that we’re all sensing. Our modern comforts and conveniences have accumulated to the point that they have stopped making us feel better and started making us feel worse. Some primal instinct lurking deep inside is trying to tell us that what is needed is a good, hard sweat—some struggle in our lives; some physical challenge. The best way I know to overcome low motivation for running is to get back in touch with the source of my passion to run. Motivation and passion are somewhat different. Passion is an overwhelming love for the experience of a favorite activity. Motivation is a drive to engage in an activity based on some reward the activity offers beyond the simple enjoyment of the experience itself. When you have great passion for running, or anything else, you don’t need any extra motivation. But motivation without passion can only take you so far. Rest was not an option. Endurance never sleeps. This entry was posted in Adventure Racing and Ultra-running, Reading Notebook by seanb724. Bookmark the permalink.